In this seventh-grade humanities lesson, students prepare a Tortilla Scramble with Roasted Potatoes and are introduced to the Reflection Cards as a means of identifying and practicing the kitchen skills utilized in their culminating lesson: the Iron Chef Challenge. Utilize Reflection Cards to promote self-reflection on team and individual performance. Communicate effectively to coordinate a variety of tasks. Practice reading and following a recipe. Focus on the People, Kitchen Classroom, and Clean as You Go Reflection Cards and practice maintaining a clean cooking station through collaborative and individual work. Communicate clearly to complete two dishes requiring different timing. Follow and complete Tortilla Scramble recipe. Create the Roasted Vegetable visual aid on the chalkboard. Copy the Tortilla Scramble recipe to hand out. Welcome students back to the kitchen and introduce the lesson: Tortilla Scramble and Roasted Potatoes. Explain that their spring rotation consists of five lessons, with the fifth and final lesson being the Iron Chef Challenge. 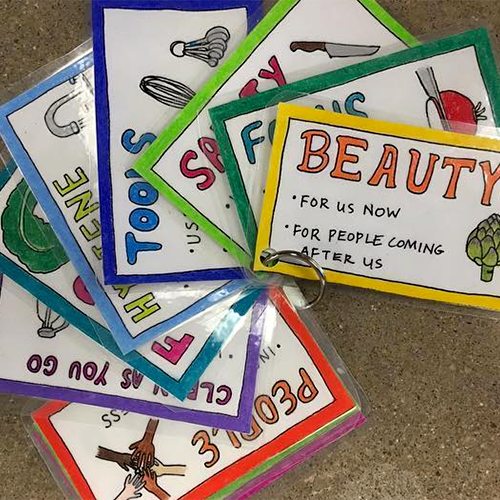 Introduce the Reflection Cards as categories from the Iron Chef ballot and explain that the kitchen staff has prepared a series of lessons and matched each one with a few of the Reflection Cards to help students practice specific skills. Identify People, Kitchen Classroom, and Clean as You Go as the cards/skills matched with this lesson. Define the People category as focusing on teamwork and collaboration and give examples such as: Was the group inclusive when sharing ideas and making decisions? Did you listen when others were talking? Tell the story of an Iron Chef team that had the most delicious, beautifully presented food but lost points because they did not work collaboratively and harmoniously. Introduce the Kitchen Classroom Reflection Card and have students do a quick review of kitchen systems. Introduce the Clean as You Go Reflection Card and explain that they will be practicing this skill by working as a group to clean and organize their cooking stations before inviting their teacher to come and assess their results. Introduce the Tortilla Scramble recipe, review the method for roasting vegetables, and point out that these two recipes have different cooking times, requiring students to coordinate with each other to ensure that the dishes are ready at the same time. Small-group check-in: What is your favorite way to prepare eggs? Meet with the table groups to introduce the ingredients, review the recipe, and assign jobs. If there is time, ask them to share a specific example of how they practiced a skill from one of the Reflection Cards paired with the lesson. Adding Jobs: Preparation of optional toppings can provide additional jobs. Ideas for toppings are: cilantro, scallions, lime, jalapeños,and sour cream. Corn Tortillas: We liked the 100% corn tortillas better than ones with both corn and wheat flour. The wheat-corn mix tended to become too sweet when cooked. Tortilla Mush: Sautéing the vegetables and tortilla strips over high heat, waiting until the vegetables are quite cooked to add the tortillas, and stirring sparingly all help to keep the tortilla strips from getting mushy. Hot Sauces: We always have a variety of hot sauces available. Different students identify with different hot sauces, and providing an array of hot sauces acknowledges students’ personal preferences and cultures. It can be a great conversation starter to ask students which hot sauce is their favorite, or whether they like to eat different kinds with different foods. Cooking Techniques: This lesson incorporates roasting and sautéing. We use this specific language as much as possible (as opposed to “cooking”) to help students learn to recognize and differentiate between cooking methods. Potatoes: We used 2¼ pounds of potatoes per group (about 10 people) for this lesson. Timing: This is a great lesson for students to think about cooking rates and practice communicating with one another to coordinate timing between dishes. To make sure both eggs and potatoes are hot when they get to the table, help students plan to wait until the potatoes are mostly cooked to start scrambling the eggs. It is fine to saute the onions, peppers and tortillas before-hand and turn off the heat if you need to wait. Just make sure to heat the pan again before adding the eggs. High Heat: This recipe came out best for us when we started sautéing on high heat. Popular Food: Students really loved the scramble and the potatoes and were impressed by how similar the roasted potatoes were to french fries. Connecting to Home: Asking about how students cook eggs at home was a great conversation starter that got students excited to share what they cook at home. Previous Experiences: Students often wanted to do the scrambled eggs their way instead of following the tortilla scramble recipe. Asking them how they cook them and affirming that their methods sounds good, too, could often help them come to terms with cooking it differently in class.